Mesa's awesome new Mark 5:35 Head and Widebody Closed-back 1x12 Cab in matching British Cabernet! Because of our special relationship with Mesa Boogie we can get this as fast, or faster than anyone in the industry. In some cases, we even have preferred build slots we can offer you. Most of the time when we sit down to try out a new amp, we think to ourselves, "Alright, what can this thing do?" Sitting down with the Mesa Mark 5:35, we found ourselves thinking, "What CAN'T this thing do?!?" Anyone who's familiar with Mesa's Mark 5:25 will know pretty much what to expect from this baby, as it's basically an upgrade of their wildly popular Mark 5:25. With three different wattage settings to choose from (10, 25 and 35), you'll be able to dial in feel, headroom and responsiveness to fit any situation. It boasts "2 Channels and 6 Modes of Mighty Compact Power," but after experimenting with this amp for a while, that description almost seems like an understatement. Flipping through the different modes, we were treated to a dizzying array of tonal choices that got even more impressive when the graphic EQ and mid-boost were added to the party. A feature that we found particularly helpful and genius on Mesa's part is the addition of independent solo controls for each channel, giving you yet another layer of flexibility in an amp that's already overflowing with it. It's no exaggeration to say that we could have played through this Mark 5:35 all day! 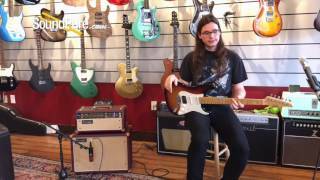 In this video, Sound Pure electric guitar specialist Frank Hamilton describes and demonstrates the Anderson Drop Top Trans Teal Burst #02-16-16N with a Strymon El Capistan dTape Delay Effect Pedal, a Shure KSM313/NE Dual-Voice Ribbon Mic with Roswellite Ribbon and a Mesa Boogie Mark Five 35 British Cabernet Head & 1x12 Cab. 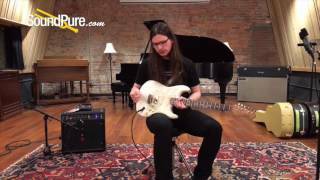 In this video, Sound Pure electric guitar specialist Frank Hamilton tests out the Suhr 2016 Collection Macassar Ebony Modern #043 with a Shure KSM313/NE Dual-Voice Ribbon Mic with Roswellite Ribbon, a Strymon El Capistan dTape Delay Effect Pedal, and a Mesa Boogie Mark Five 35 British Cabernet Head & 1x12 Cab. 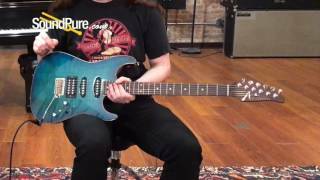 In this video, Sound Pure electric guitar specialist Frank Hamilton tests out the Suhr Modern Pro Trans Blue Denim Slate HSH Electric with a Mesa Boogie Mark Five 35 British Cabernet Head & 1x12 Cab, a Strymon Timeline Multimensional Delay & Looper Pedal and a Shure KSM313/NE Dual-Voice Ribbon Mic with Roswellite Ribbon. 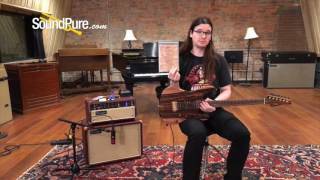 In this video, Sound Pure electric guitar specialist Frank Hamilton describes and demonstrates the Suhr Classic Pro 3-Tone Burst Tinted Maple HSS #27527 with a Mesa Boogie Mark Five 35 British Cabernet Head & 1x12 Cab, a Strymon Timeline Multimensional Delay & Looper Pedal and a Shure KSM313/NE Dual-Voice Ribbon Mic with Roswellite Ribbon. 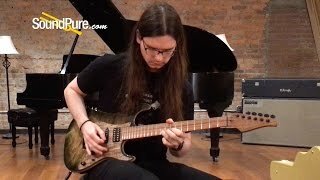 In this video, Sound Pure electric guitar specialist Frank Hamilton describes and demonstrates the Suhr Modern Carve Top Desert Gradient HSH Electric #29900 with a Mesa Boogie Mark Five 35 British Cabernet Head & 1x12 Cab, a Strymon Timeline Multimensional Delay & Looper Pedal, and a Shure KSM313/NE Dual-Voice Ribbon Mic with Roswellite Ribbon. 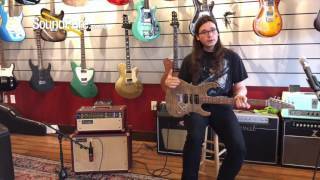 In this video, Sound Pure electric guitar specialist Eddie Berman plays a Suhr Custom Classic T special order through a Mesa MK V 35 Head and 1x12” Cab. 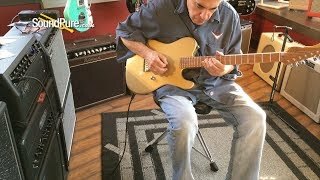 In this video, Sound Pure electric guitar specialist Frank Hamilton tests out the Michael Tuttle Tuned S Olympic White HSS Electric #415 with a Mesa Boogie Mark 5:35 1x12 Combo Amp, a Strymon Timeline Multimensional Delay & Looper Pedal and a Shure KSM313/NE Dual-Voice Ribbon Mic with Roswellite Ribbon. 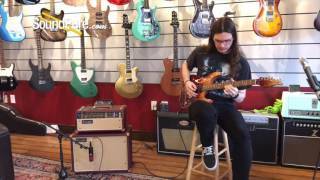 In this video, Sound Pure electric guitar specialist Frank Hamilton describes and demonstrates the Suhr Standard Faded Trans Green Burst HSH Electric #30391 with a Mesa Boogie Mark 5:35 1x12 Combo Amp and a Shure KSM313/NE Dual-Voice Ribbon Mic with Roswellite Ribbon. Following a 35 year tradition of 4xEL84 based power with successful models such as the Caliber™, Maverick™, Nomad™ and Lone Star®, we’re proud to add the legendary and first-ever MARK preamp to the 9-Pin power lineup and introduce the MARK FIVE: 35™. This light-middleweight is an upgraded rendering of our recent smash hit, the mini-platform MARK FIVE: 25™ and like it, the new 35 boxes far above its class. To further bolster the new MARK FIVE: 35's stage-ready resume, we’ve added a Channel Independent SOLO Feature, a long-spring tank for the all-tube Reverb, the complete set of Voicing Choices from our CABCLONE™ with the addition of the VINTAGE setting to its on-board DI Output and an upgraded Footswitch for access to the new foot switchable choices. This new blend of perfect clip-ability on demand and exciting, dynamic headroom when you need it, creates the most adaptable MARK amplifier yet! Utilizing our Dyna-Watt™ technology within the Multi-Watt™ Channel Assignable power array, this performance-oriented model offers substantially more headroom, punch and power in 35 WATTS, while two low-power options, 25 and 10 WATTS, provide a looser feel and enhanced power clip expression. Each of the 3 Power Level settings has its own sonic character and can be used to further authenticate the sound styles you are aiming at with your Mode choices and preamp settings. The power ranges and wiring styles are; 35 Watt (Dyna-Watt Power), 25 Watt (Dyna-Watt Power) and 10 Watt (Class AB Triode). The MARK FIVE: 35, like the MARK FIVE™ it’s born from, is really a collection of iconic amplifiers...it’s a living history of MESA/Boogie! Channel 1 covers the entire gain spectrum from chiming tight clean sounds, through furry, edge-of-clip, to Classic Rock CRUNCH and all the way up to burning saturated Lead sounds. Channel 2 delivers the legendary MARK II-C+ and warmer, rounder MARK IV in all their glory and the XTREME Mode from the MARK FIVE. To round out the two-Channel, six Mode preamp and lightweight but mighty sounding power section, the MARK FIVE: 35 is available as both a 19” traditional “Boogie® size” Head and a portable 1x12 Combo. The Head can sit atop a number of MESA® Extension cabinets and the Combo can be coupled with an additional Extension as well for greater coverage. And to further enhance your enjoyment of either of these formats, a wide range of covering options may be chosen from our custom vinyl and leathers as well as exotic hardwood cabinetry. You'll find added tone shaping in Channel 1 via the MID/BOOST feature on the MARK FIVE: 35 . From 0 to 5 on the MID/BOOST you will find the normal range of a standard MID control in a condensed form. From 5 to 10 on the MID/BOOST, a wonderful graduation of overdrive possibilities unfolds, enhancing gain over a broad midrange spectrum and increasing the versatility of each of the 3 Modes in Channel 1. CLEAN and FAT give way to furry and howling, while CRUNCH rolls past Classic Rock to unleash Metal rhythms and molten layers of harmonic complexity for Lead work. Our legendary BOOGIE® 5-Band Graphic EQ provides the ultimate in sonic flexibility. Dial your sound in with the standard Tone controls and if further shaping is desired, employ the targeted power of the 5-Band Graphic EQ and tweak as you see fit. The MARK FIVE: 35 incorporates independent SOLO controls that allow each Channel to have its own level for the SOLO foot switchable boost feature. On this 35 Watt MARK rendering, however, unlike other MESA amplifiers, the SOLO feature is really an alternate MASTER control wired in parallel with the Channel MASTER and, therefore, can achieve levels above or below that of the Channel MASTER controls. A “Preview” feature is built into the Footswitch that indicates the status of the SOLO control of the Channel you are NOT playing through. A dim YELLOW LED above the SOLO button of either Channel on the Footswitch indicates the SOLO is called up and will be active when you next engage that Channel. At that time, the LED on the Footswitch will illuminate full strength and change color to match the Channel’s LED color (Green for Channel 1, Red for Channel 2) and the SOLO will determine the Channel’s volume level until you switch it off and return to using the Channel’s MASTER control. The MARK FIVE: 35 includes a HEADPHONE Output for personal enjoyment of the amplifier when it is not possible or convenient to play through a speaker. This jack derives its “speaker simulated” signal from the included CABCLONE D.I. feature and delivers a surprisingly good rendering of the MARK FIVE: 35’s sound and feel to your headphone set of choice. Use this output for late night practicing as it offers an authentic and inspiring Tone and feel by including your power tubes and output transformer in the signal path, and is then frequency compensated and level matched courtesy of the on-board CABCLONE D.I. circuitry. The MARK FIVE: 35 upgrades include additions to the on-board CABCLONE D.I. feature, which now offers three classic “cabinet simulated” VOICING Modes and gives you the full feature set of the stand-alone CABCLONE D.I. minus the OUTPUT control. The simulations are an analog representation achieved through passive means (without op-amps to add gain for shaping) and were created using our 45 years of experience co-designing custom speakers with the world’s top makers and designing custom cabinets to load them in. These CABCLONE “virtual-cabinet” options allow you to tailor the direct circuit’s EQ response for different cabinet styles, gain regions and/or different instruments and pickups. The choices range from bright and open with enhanced top end for buffed clean sounds (OPEN BACK), to a more compressed voice with the upper harmonics shelved for warm, singing single note sounds and thick high gain rhythm work (VINTAGE), to a scooped midrange and boosted top and bottom response curve called CLOSED BACK that excels for heavy Crunch rhythm and high gain Lead work. Among these three VOICING options here on the MARK FIVE: 35 you have a broad spectrum of responses to choose from when going Direct. How you wish to apply them is up to you and these descriptions merely provide a guideline to start with. Regardless of how you dedicate them to your Channels for your recording needs, you'll have all the power needed to capture great guitar sounds Direct.